14 April 1953: Dmitry Konstantinovich Efremov, chief test pilot for the Kamov Design Bureau, made the first flight of the prototype Kamov Ka-15 helicopter. 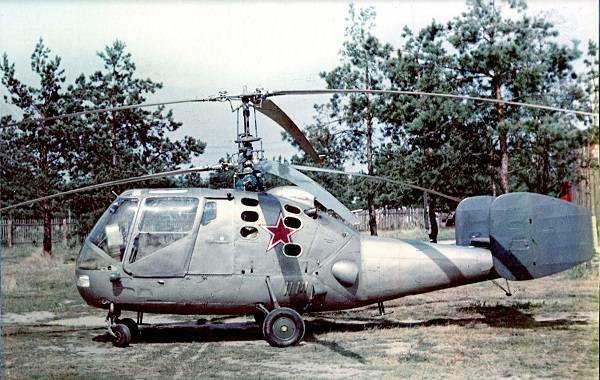 The Ka-15 was a single-engine, two-place, light helicopter, flown by a single pilot. It used two fully-articulated, three-bladed, counter-rotating coaxial rotors. 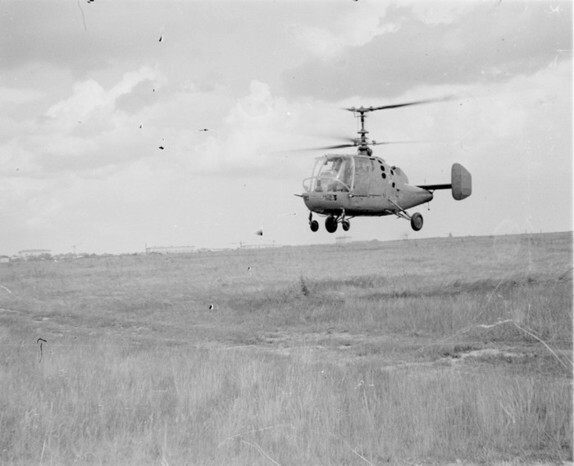 The helicopter had two vertical fins mounted at the ends of a horizontal stabilizer, and four-wheeled fixed landing gear. The fuselage of the Ka-15 was 6.26 meters (20 feet, 6.5 inches) long. The main rotors’ diameter was 9.96 meters (32 feet, 8.1 inches), and the overall height of the the helicopter was 3.35 meters (10 feet, 11.9 inches). The span of the horizontal stabilizer and vertical fins were 2.85 meters (9 feet, 4.2 inches). The Ka-15 had an empty weight of 996 kilograms (2,196 pounds), normal takeoff weight of 1,360 kilograms (2,998 pounds), and maximum takeoff weight (MTOW) of 1,460 kilograms (3,219 pounds). The rotors turn at 333 r.p.m. The upper rotor turned clockwise, as seen from above. (The advancing blade is on the left), and the lower blades turn counter-clockwise (their advancing blades are on the right). The area of the main rotor disc was 155.83 square meters (1,677.29 square feet) with a solidity ratio of 3% per rotor. (This is the lowest coefficient of disc area of any helicopter.) Each main rotor blade was trapezoidal, with a theoretical chord at the axis of rotation of 300 millimeters (11.8 inches), narrowing to 100 millimeters (3.9 inches) at the blade tip. The blades incorporated 12° of negative twist. The Ka-15 was powered by a single air-cooled, supercharged 10.131 liter (618.234 cubic inches) Ivchenko AI-14V nine-cylinder radial engine with a compression ratio of 5.9:1. The engine was rated at 188 kilowatts (252 horsepower). It weighed approximately 200 kilograms (441 pounds). The Ka-15 had a cruise speed 120 kilometers per hour (75 miles per hour) and maximum speed 155 kilometers per hour (96 miles per hour). The service ceiling was 3,500 meters (11,483 feet). It could hover out of ground effect (HOGE) at 600 meters (1,969 feet). The helicopter had a normal range of 278 kilometers (173 miles) and maximum range of 520 kilometers (323 miles). The performance of the Ka-15 was better than had been predicted. After several years of testing, the Ka-15 entered production in 1956. 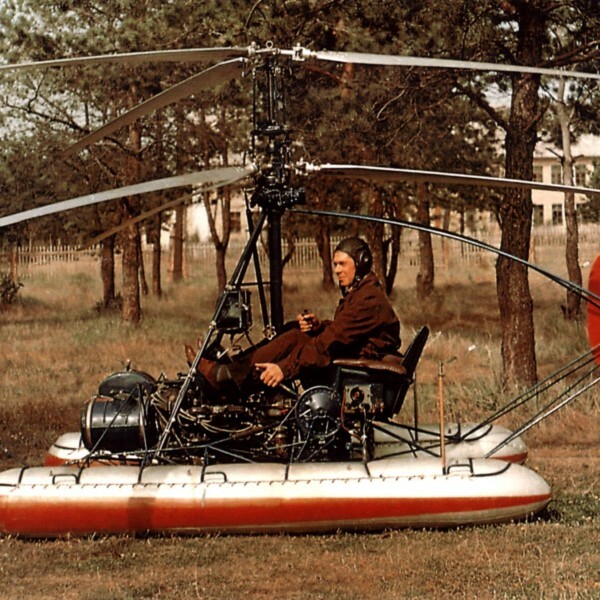 It was the first mass-produced coaxial helicopter, with approximately 375 being built by Aircraft Factory No. 99 at Ulan-Ude, the capitol city of the Buryat-Mongolian Autonomous Soviet Socialist Republic. A Kamov Ka-15, circa 1953. In a coaxial rotor system, one rotor is placed above the other, with the drive shaft for the upper rotor inside the hollow drive shaft of the lower. As in tandem rotor helicopters, each counter-rotating rotor counteracts the torque effect of the other. There is no anti-torque rotor (tail rotor) required. In helicopters using a tail rotor, as much as 30% of engine power is required to drive the tail rotor. With counter-rotating rotors, all of the engine’s power can be used to provide lift and thrust. A second benefit of a coaxial rotor is that the dissymetry of lift of each rotor is also canceled out. There is no translating tendency while in a hover, and higher forward speeds are possible because the effect of retreating blade stall is reduced. A helicopter with coaxial rotors is more compact than a similar helicopter with tandem rotors. This makes it useful for operations in confined areas or aboard ships. Nikolai Ilich Kamov was previously known for his autogyro designs, which were first produced in 1929. These included the Tsentralniy Aerogidrodinamicheskiy Institut (Central Aero-Hydrodynamic Institute) TsAGI A-7, which was the first armed autogyro. The Kamov Design Bureau was established 7 October 1948 at Lyubertsy, near Moscow, Russia. 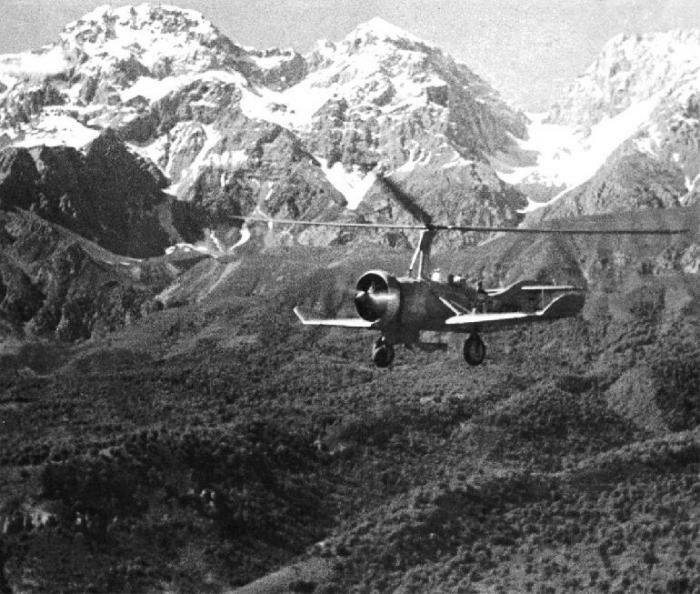 The Kamov-designed TsAGI A-7 autogyro was armed with two 7.62 mm machine guns and could carry four 100 kilogram (220 pound) bombs or six RS-82 rockets under the fuselage. Ефремов Дмитрий Константинович (Dmitry Konstantinovich Efremov). Ефремов Дмитрий Константинович (Dmitry Konstantinovich Efremov) was born at Moscow, in the Russian Socialist Federative Soviet Republic, 30 October 1920. In 1941, Efremov was a cadet at the Bauman Aero Club. He entered the Red Army the same year and was sent to the Saratov Military Aviation Gliding School, at Samara, Kuybyshev, Russia, U.S.S.R., for training as a military glider pilot. During the Great Patriotic War, Efremov flew gliders behind enemy lines. 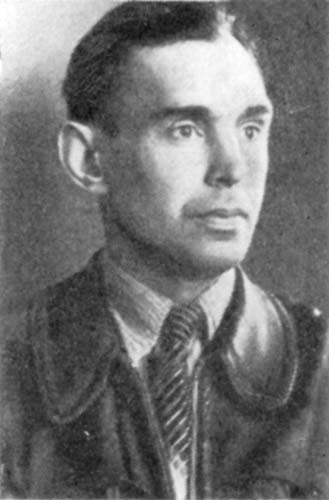 He was next assigned to an experimental test squadron of of the Airborne Forces, and then as a pilot instructor at the aviation school of the Airborne Forces in Slavogorod, Altai Krai, Russia, U.S.S.R.
Efremov contracted tuberculosis and in January 1948, was discharged from the Red Army. He was employed as a senior technician at TsAGI, and in November of that year went to work as a mechanic at Kamov OKB. He made the first flight of the Kamov Ka-10, and was then sent to test pilot school. Efremov returned to Kamov OKB after completing test pilot school and was soon promoted the the design bureau’s chief pilot. 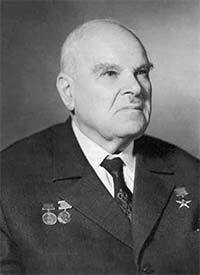 He made the first flights of the Ka-15, Ka-18 and Ka-25 helicopters. 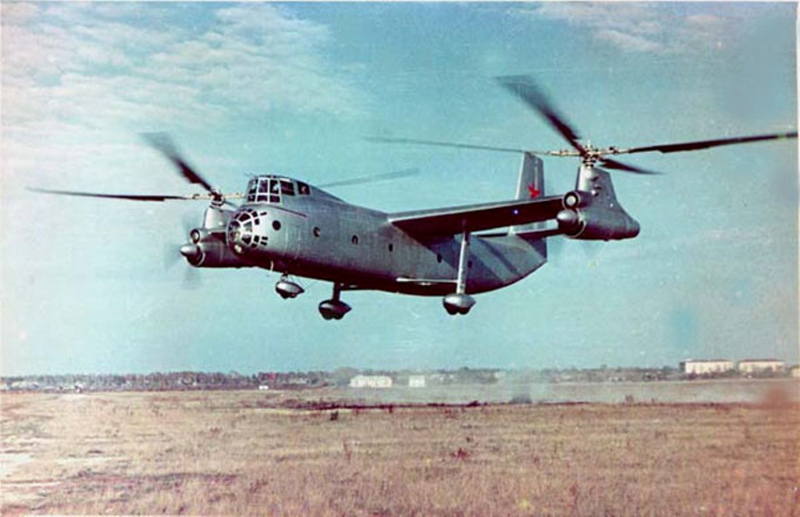 On 28 February 1962, Efremov and a flight test crew were conducting a long-distance test flight of a Kamov Ka-22M gyrodyne prototype, 01-01, 63972, from Tashkent, Uzbekistan, to Kzyl-Orda, Kazakhstan. During an intermediate refueling stop in Turkestan, mechanics found a loose or missing retaining nut for the left support of the synchronizing shaft. The problem was repaired and the flight continued. While on approach to the main runway at the Dzhusaly airport, the gyrodyne suddenly banked left, entered a left spiraling turn, and, in an inverted dive, crashed on the runway. The Ka-22 exploded and burned. Dmitry Konstantinovich Efremov and seven men of his flight test crew were killed. TDiA would like to thank regular reader Mike for suggesting this topic. Great article about the Ka-15! Please note that some of the conversions listed from kgs and lbs are incorrect. It looks like some of the weights were divided instead of multiplied.